MBTA 01700 Series train on the Red Line at Longfellow Bridge. Photo by Richard Panse, 2004. The biggest and longest of Boston's rapid transit lines evolved from a proposal to expand the Main Line Elevated (Orange Line) to Cambridge and South Boston in the early years of the 20th Century. As the experience of operating the el was amassed, several drawbacks were noted. Principal among these were the limitations imposed by an elevated structure zig-zagging around Boston's narrow, crooked streets. The size and capacity of the cars was limited, and the speed of operation was slowed by the sharp curves. Lastly, the elevated structure itself was not highly welcome in the neighborhoods it served. The Washington Street Tunnel, opened in 1908, proved that a direct route vastly improved the service operated, and planning began for a line which would be free of sharp curves and served by the largest subway cars in the world. The line was built in five stages over a period of almost 75 years. The first section built between 1909 and 1912 had 4 stations, three in Cambridge plus one in Downtown Boston and connected Harvard Square to Park Street (Under). Two more stations were added to this section, a special service station in Cambridge in 1912 and a regular stop in Downtown Boston in 1932. The second phase was built between 1912 and 1918, and was known as the Dorchester Tunnel despite the fact that is ended short of its namesake community. This section added four stations to the route, two in Downtown Boston and two in South Boston. A further addition, built between 1924 and 1928, known as the Dorchester Extension, was the first to reuse a former railroad right of way, and added five stations to the line, all in Dorchester. No further changes were made until 1966, when work began on the South Shore Extension. This project, which took almost 20 years to plan and another 20 to construct, added five stations, four in Quincy and one in Braintree. The final addition, the Northwest Extension added only three new stations, two in Cambridge and one in Somerville, but required the relocation of the original Harvard terminal, and the construction of two temporary stops. Construction began in 1979 and was completed in 1985. Stations on the extensions were opened as they were completed, with the maximum number opened at any one time being 3. The initial construction of this line marked the initial move away from the systems designed to be compatible with the original elevated systems in Boston, Brooklyn, Chicago, Manhattan and Philadelphia, The new lines built under the Dual Contracts in New York and under Broad St. in Philadelphia would follow this new trend, as would the systems developed in many cities in the second half of the 20th century. The cars designed for the Broad Street line would closely resemble the Boston cars, while the BMT Standards in New York would take on their own unique appearance while adding some interesting twists to the basic layout. Historical Red Line Route Map. Route map designed by Gerry O'Regan (PDF Format). As we look at the individual stations, it is important to remember that in Boston, surface and rapid transit service has always been closely linked. Almost every stop has or has had some interconnection between surface and subway, and many included transfer provisions within the paid area. Often the modifications made to the stations were closely related to changes in surface vehicles or transfer policies, and for that reason, some of the descriptions are lengthy. Alewife. (Opened March 30, 1985) Two tracks with an island platform. Tracks continue west into a small layup yard. A scissors crossover east of the platform handles reverse moves. This station is underground, similar to a large box open to the ground level, with parking facilities above. Skylights from the mezzanine level allows daylight to enter the subway station. The platform is connected by stairs, elevator, and escalators to a fare control area at street level. A bus terminal and pedestrian entrance also occupy this level. The mezzanine provides access to the parking structure via a bank of escalators that rise directly from the mezzanine to each of the third, fourth, and fifth floors of the parking structure. The escalators run only in the peak direction; access at other times provided by the stairs and elevator. Leaving Alewife, the line proceeds in an easterly direction in a cut and cover subway under the right of way of the former Somerville Freight Cut-off. A second scissors crossover is located just prior to arriving at Davis, the next station. Davis Square (Opened December 8, 1984; trackage in use beginning September 6, 1983) The next station is Davis Sq. where the Freight Cut-off right of way crosses the intersection of Highland Av., Holland and Elm Sts. Again there is an island platform with two tracks. The fare control is on a gallery mezzanine above the inbound track at the center of the platform, and is connected to the platform by stairs, elevator, and escalator. Street exits are at Holland St. to the west and College Av. to the east. Trackway walls are a brown brick, while the ceiling is plain concrete. A combination of descending track grade, and rising local topography place the roadbed low enough for deep bore tunneling at the east end of the platform and this method is used for the next two stops. This station serves nearby Tufts University. Leaving Davis, the line curves away from the Freight Cut-off and proceeds southeasterly under private land, eventually winding up under Massachusetts Av. Porter Square (Opened December 8, 1984; trackage in use beginning September 6, 1983.) We enter Porter Sq, Station which is the deepest below street level on the system. The station has several levels, There is an entrance lobby at street level with stairways down to a pair of commuter rail platforms one level down and via the usual three modes to a fare control lobby north of the commuter rail tracks at the same level. The glass headhouse at the street features a steel wind-operated sculpture which resembles hot air balloons, and the Route 77A - Harvard to North Cambridge trolleybus line serves the station. The MBTA commuter rail stop has two tracks with side platforms in an open cut east of Massachusetts Av., but here we are mostly concerned with the subway station. From the fare lobby, escalators and elevators provide the primary access to the subway platforms with the nine flights of stairs intended for emergencies only. The inbound platform lies above the outbound one with fully accessible connections between them. The inbound (upper) level is approximately 85 feet below the surface, with the outbound (lower) level approximately 100 feet below. From the upper level one can look down over a balcony railing to the lower level platform and track. Not too many rapid transit stations are built like this, and Boston has two! (Harvard is the other, and Rosslyn station in Washington D.C. is another.) Both levels share a single tube of about 40 feet in diameter. The inner surface of the station tube is covered with perforated metal panels, painted an off white. Various points around the station are adorned with bronze castings of discarded gloves. From here the twin tubes follow the path of Massachusetts Av. passing through bedrock before emerging just below the surface near Garden St. Before entering Harvard station, the line curves around the portal of a second cut-and-cover subway which is part of the Harvard complex. Harvard (New) (Opened September 6, 1983; main lobby opened March 2, 1985; bus tunnel reopened September 7, 1985.) Harvard Station is a complex facility with several platforms and levels. The east wall of the station abuts famous Harvard Yard, while the west wall abuts another subway. The outbound platform lies above the inbound, and both lie to the west of the tracks which run in a north-south orientation, Stairs link the north ends of both platforms with an additional flight leading up from the inbound to a part-time fare lobby and then to open stairways to the surface at the corner of Massachusetts Av. and Church St. This entrance served the station when it initially opened, while construction proceeded further south. The south ends of both platforms transition to ramps which lead to the main fare lobby. This is a cavernous facility with a high ceiling, and includes a Dunkin Donuts and several other vendors outside the paid area. Beyond the turnstyles, stairs and an elevator lead up to the surface at the corner of Massachusetts Av. and John F. Kennedy St. Doors from the unpaid area also lead out to a platform serving buses arriving from the south and west and departing to the north and northwest. These buses run in a tunnel opened with the original Harvard Station in 1912, It begins at a portal at the intersection of Mount Auburn and Eliot Sts. and follows Brattle St. and Massachusetts Av. to a portal opposite Cambridge St. in a reservation east of Massachusetts Av. It is this portal's location which required the curves in the Red Line's tunnels north of the station. Although both portals have been rebuilt due to development at the south end and subway construction at the north end, most of the tunnels and platforms between are the original 1912 construction, The lower level serves southbound buses and is divided into loading and unloading zones as is the upper level. It is reached via stairs and a ramp from the fare lobby. Stairs at the south end of both platforms connect them with an exit to Brattle Sq. were added during the construction of the Alewife extension. Original tile name tablets, crimson of course, are still visible in the bus tunnel. The station was served by streetcars from 1912 until 1958. Pavement was added for trackless trolley operation in 1938, and buses with catalytic mufflers have been allowed to use it since the late 1960s. Leaving Harvard, the Red Line tracks make a sharp turn to the east, and continue under Massachusetts Av. We now depart Harvard, and the inbound track rises to the upper level on a southerly curve. A trailing crossover marks the intersection of Massachusetts Av. and Quincy St. while a facing crossover and a curve back to the east marks the intersection with Mount Auburn St. From here a long sweeping curve to the east by southeast brings both street and subway to Central Sq. This is the original Cambridge Subway, opened in 1912. It is distinctive in its lack of a curtain wall or any division between the tracks with the exception of a few columns in the stations. Before continuing south, we will discuss the previous stations at this location. Harvard (Opened March 23, 1912, closed January 31, 1981; bus tunnel closed March 24, 1979.) The original Harvard Station, opened in 1912, sat in an east-west orientation. Like the present station, it was a bi-level affair, with the inbound track on the lower level. The original headhouse on the surface was a brick oval building, which was later replaced with a simple cast-iron and copper shelter. The later shelter now stands close to its original location and houses Out-of-Town News, another Harvard Sq. icon. Two stairways led down from the surface shelter, both in an easterly direction. The northerly stair descended to the upper level and was used for exit. No gates or turnstyles were provided. The southerly stairway led to the lower level and the fare control. Ramps outside of fare control connected both levels to the bus platforms. An escalator from the upper bus platform ascended in the space between the two stairways, ending at street level on the opposite side of the shelter. A high exit turnstyle on the upper level led to an exit on the north side of Massachusetts Av. opposite Dunster St. West of the station the tracks curved to the southwest and leveled out into a turnback facility, which then exited a portal into the Eliot Shops. Harvard was replaced with Harvard-Holyoke to enable the construction of the curve leading to the present Harvard. A small portion of the original platform exists at the east end of the curve on both levels, but is difficult to see in the dark tunnel. Harvard-Brattle (Opened March 24, 1979, closed September 2, 1983.) Since the construction of the extension to Alewife would require closing the bus tunnel for several years, it was decided to provide a transfer station outside busy Harvard Sq. Following the opening of Cabot Shops in 1970, the Eliot shops were closed and demolished with the land going to Harvard for its John F. Kennedy School of Government. However, a small section south of the portal was retained for future use. In 1979, the three tracks of the turnback facility were extended south into the old yard, and a pair of island platforms were constructed between them, Stairs at the north end of each platform led to a fare lobby in a small building at street level. The entire facility was constructed of unpainted pressure treated wood. Named Harvard-Brattle, it resulted in a short extension of the line, and gave passengers a chance to ride over tracks which were seldom open to them over the previous 70 years. Harvard-Brattle was closed when the present Harvard Station was opened, and was demolished. The only hint remaining is the concrete wall at the top of the portal, with the cast in lettering "Boston Elevated Railway - 1912". Stadium (Opened October 26, 1912, closed Late 1960s.) Perhaps the most seldom used station on the entire system was Stadium, located along the east edge of the yard adjacent to Eliot Shops. Consisting of a single track with a narrow platform, this unusual station was opened only for events at Harvard Stadium. Accessed through gates in the wall separating the yard from Boylston St. (now John F. Kennedy St.) the platform was used only for discharge of passengers before games and for boarding afterwards. There was no permanent fare control, gatemen being stationed at the entrances with fare boxes when trains were boarding. The platform was located on a loop track, and could be reached from either direction. under control of Tower P at the turnback. The station was last used in the 1960s, and demolished after the shops were closed in the 1970s. No trace remains today. Harvard-Holyoke (Opened January 31, 1981, closed September 2, 1983.) The final station in the Harvard complex was Harvard-Holyoke, a temporary facility constructed to serve while the tunnel was being connected to the present station. Like all the stations at Harvard, this one was on two levels with the inbound below. The platforms were located directly across from the original ones, on the south side of the tracks. Fare control was on the upper level with an open stairway leading up to the surface near the corner of Massachusetts Av. and Holyoke St. Another flight led down to the lower level. A part time entry was provided at Dunster St. Although temporary, the station had a very finished appearance, with brick floors and red matte tiled walls. When the new station opened, the Harvard-Holyoke platforms were bricked up and are now used for storage. Part of the turnback area also remains hidden from sight south of the present lobby. The original Harvard, Stadium, Harvard-Brattle and Harvard-Holyoke were all constructed for 4 car trains and were never lengthened. All of the stations on the Alewife extension were designed for six car trains. Construction of the original part of the Cambridge Subway began on August 12, 1909. Unlike the subways within Boston which were built by the Boston Transit Commission, the Boston Elevated planned and constructed this section. Central (Opened March 23, 1912.) Central Sq. Station sports two tracks with side platforms, and stretches from west of Prospect St. to Essex St. A row of columns with archways overhead and iron fencing separates the paid and unpaid areas, with fare control at the center of the inbound platform and at the west end of the original outbound platform. Several stairways plus an escalator and elevator connect each platform to the surface, there is no mezzanine or crossunder. The platforms were originally about 300 feet long, and comfortably handled a four car train. High exits at the east end of the station emerge at Essex St. Both platforms were extended to the west in the 1980s, and now measure about 440 feet and can handle 6 car trains. Another set of high exits at the west end of the extensions emerge just west of Prospect St. A low center wall with columns divides the tracks in the original section of the station only. Of all the pre WWII stations on the Red Line, Central Sq. is the least altered, retaining many of its original features, including the six name tablets, white on terra-cotta. These were excavated from beneath plaster installed in a 1970s remodeling, and are somewhat worse for the wear, but they are the only name tablets visible on a Red Line platform today. The granite walls around the stairways at street level are gone, though, replaced by low iron fences. Leaving Central, the tunnel curves to the east again and is now under Main St. A long tangent brings us to Kendall - MIT. Kendall-MIT (Opened March 23, 1912.) Like Central, this is a two track station, with side platforms, separate fare controls, and no mezzanine or crossunder. Dark Green was the accent color with white lettering on the name tablets. The inbound fare control was a wide spot at the east end of the platform, with a collector's booth and a couple of turnstyles. A high entry/exit turnstyle now serves here. The outbound side originally had several high exit turnstyles, and a single iron maiden for entry. You had to cross the street, go downstairs, buy your token, go upstairs, cross the street again, walk a half block to the off street bus shelter, go back downstairs, and hope the iron maiden wasn't rusted and painted to the point where it wouldn't turn. In the late 1970s, the outbound platform was opened up and passengers admitted without charge. The Alewife extension finally increased outbound traffic enough to warrant a full time fare control. Later, a mirror image of the inbound facility was provided, and the bus terminal was abandoned. Since passengers were challenged here, it was only appropriate that the motorman were too-- the platforms were 270 feet long, ten feet shorter than a four car train! This was not a major problem for the original fleet, where the first door was about 5 feet in back of the cab, but when the 01400 cars arrived in 1962, their first door was right behind the cab, making pinpoint stops a necessity. With the train stopped correctly, both the motorman and the guard in the fourth car were in the tunnel. The extension constructed in the 1980s, was to the west, like Central, and brought the length to 440 feet, comfortable for 6 cars. New fare controls, spacious and at platform level are located near the middle of the extensions. As at Central the center wall is limited to the original part of the station. It is more substantial than that at Central. Three mechanical musical sculptures, operated by levers on the platforms, occupy part of the remaining space between the tracks. Leaving Kendall-MIT, the tracks begin a steep upgrade, reaching the surface at the west end of the Longfellow Bridge, which they cross on a center reservation. The bridge was built by the Boston Transit Commission and opened to the public on August 3, 1906. It is also known as the West Boston Bridge and the Salt and Pepper Bridge. The former name was inherited from its less ornate predecessor, while the latter honors its 8 towers, which resemble fancy salt and pepper shakers. The four towers around the center span give it the appearance of a drawbridge, which it isn't. The view is quite scenic here, offering a panorama of the Museum of Science, Bunker Hill Monument, Zakim and Tobin Bridges, and Charles River Park apartments to the north, and Beacon Hill. the Hatch Shell and the Back Bay Skyline to the south. In season, the Charles River, filled with many boats and bounded by parks adds a stunning vista on both sides. At the west end of the bridge are the remnants of an interesting connection which allowed cars from the Blue Line (East Boston Tunnel) to be brought to the Eliot Shops for servicing. This connection consisted of crossovers from the rapid transit tracks to parallel streetcar trackage on the bridge, which then passed through Charles Circle and continued up Cambridge St. to South Russell St. where an incline and portal led to the East Boston Tunnel Extension west of Bowdoin Station. Cars needing repairs were shuttled along this section under their own power or were towed by a work car. The practice started in 1924 when the East Boston Tunnel was converted to high platform. Local streetcar operation in the area was discontinued in 1925, but the tracks were retained until the Orient Heights Shops opened in 1952, eliminating the need for the unusual transfer operation. Charles-MGH (Opened February 27, 1932.) On the east side of the bridge the tracks level out and enter Charles MGH station, a rather plain elevated affair with two tracks and outside platforms. Charles MGH was a late addition to the line, opening in 1932. The platforms are concrete with simple steel framed, copper clad wooden shelters overhead. A concrete headhouse containing a mezzanine fare control stood at the east end until recently. As part of a reconstruction program, it was demolished, and replaced with a temporary wooden structure at ground level in the middle of Charles Circle. A crossunder has always been provided here. An early drawing shows an art deco office tower for the Boston Elevated atop the original headhouse. It was never constructed. Platforms were originally about 320 feet long. In the 1980s, the platforms were extended west onto the bridge about 120 feet, the extensions being quite narrow and without shelter. Leaving Charles MGH the structure curves to the southeast, passing over part of Cambridge St. and some private land. This section was built by the Boston Elevated and is known as the Cambridge Connector. After crossing Lindall Pl. the structure ends just west of Grove St. entering the Beacon Hill Tunnel through the basement of an apartment house. The Boston Transit Commission began work on the Beacon Hill Tunnel on September 29, 1909. For about 100 feet in a tangent the tunnel roof is low with a center wall. It then opens into a cavernous double track bore with a high arched ceiling. This section was cut with a roof shield, and sloping downward, slowly curves to the east, passing under many residences and the State House. Park Street (Under) (Opened March 23, 1912.) We enter Park Street (Under), the last station on the original section of the line. This station has two tracks with three platforms, an island platform serving both tracks, and two parallel side platforms. The name tablets were maroon with white lettering, but have long since been covered with non-descript white tile. The station has three distinct sections. The most easterly section, about 160 feet long, is under the Park St. Station of the Green Line (Tremont St. Subway) and has a low roof. The middle section of about 180 feet has a pair of high arched ceilings which each cover a track, one side platform and half the center platform. A former tower, once in the tunnel now stands above the platform at the west end of this section. The last 100 feet comprise the 1980s extension to platform 6 car trains. The outside platforms occupy space carved out of the tunnel walls. Thick beams at ceiling height support the original tunnel arch above the tracks and center platform. Park St. marked a change in policy for the system. Instead of giving the connecting station a new name, the word "Under" was appended instead, creating a unique identity for the station, but reducing the confusion caused by multiple names. All entrances and exits from Park Street Under are in the eastern section beneath the Green Line. A wide stairway led up from the end of the center platform to a fare control lobby east of the Green Line under the intersection of Winter and Tremont Sts. From here stairways led to the surface along Tremont, emerging north and south of Winter. Station modernization in the 1980s resulted in some changes here. An elevator was added from the south side of the intersection to the lobby for handicapped access. A second elevator replaced the north half of the platform stairs. Shortly thereafter the fare lobby was rearranged to open up the Winter St. Concourse as a transfer passageway to the Orange Line. At this time, the south stairway and the elevator were fenced off as a high exit. Elevator passengers were buzzed in through a gate by the collector. In the 1990s, the fare control and north stairway were closed completely. Both outside platforms at track level continue to a high exit about 20 feet east and under the fare lobby.From here, escalators lead directly to the surface north and south of the respective stairways. Inside the fences stairs rise to the fare lobby. The stairs from the south platform were always within the paid area, but those from the north platform originally ended at a high exit into the unpaid side of the lobby due to a lack of space. This was corrected in the 1980s renovations. A passageway from the lobby opens directly onto the most easterly Green Line platform. The remaining stairways at Park St. Under are transfer connections to the main Green Line platforms. From the south platform a wide stairway leads up to each Green Line platform. A single narrow stair connects the center platform to the westbound Green Line, emerging behind the stairway to the kiosk. Two narrow stairs connect the center platform to the northbound Green Line. The westerly stair leads straight up, while the easterly one makes a right hand 90 degree right turn. Two stairs from the northerly platform to the westbound Green Line are opposite each other in an alcove off the platform. A wide stair from the top of these faces south and emerges at the far north tip of the Green Line platform. Lastly, the connection from the north platform to the northbound Green Line is a single narrow stairway, with three short flights and a brief connecting passageway. It emerges at the far north end of the Green Line platform. Starting at the east edge of Tremont St. the Dorchester Tunnel begins. Construction of this extension began on May 3, 1912. From here to South Station the "tunnel" is a double deck cut & cover subway on a descending grade. The upper deck is transected at Washington St. by the Orange Line's platforms and tracks.and lies about 20 feet deeper below the surface by the time South Station is reached. The run from Park St. Under to Washington (Downtown Crossing) has a center wall running the entire distance, all of a block and one-half, and a short southerly curve entering the platform. For the purpose of clarity, I will refer to the stations at this location by their original names, Washington (Red Line), Summer (Orange Line northbound) and Winter (Orange Line southbound). Downtown Crossing (Renamed June 26, 1985, formerly Washington; opened April 4, 1915.) Downtown Crossing has two tracks and two outside platforms which extend from west of Hawley St. to east of Chauncy St.. There is a low wall with columns between the tracks. At the west end, the platforms continue as passageways to the west side of Washington St. leading to stairways up to the Winter platform. The north stairway is divided into two equal flights. The upper flight of the southern stairway matches that of the northern one, but the lower flight is divided into three sections each on a slightly different heading. The Winter Street Concourse which is within fare control, connects the Winter platform to the head of the stairs leading to the center platform at Park St. Under. Prior to being opened to the public in the 1980s, the passageway was used as storage space and for offices, some of which still remain along the south wall. The Summer St. Concourse extends from the Summer platform to just east of Chauncy St. Originally this was entirely a paid area, with a south side fare control at the west end and a north side fare control at the east end. Four stairwells, two for each platform, connect the concourse with the Washington platforms. Each consists of two flights, connected by a semicircular landing. The westerly pair connect at the landings to direct entrances to the sub-basements of Filenes and Jordan Marsh (now Macy's). The west end fare control was part of the Summer station and extended about 40 feet along the concourse. There was a two flight stairway to the corner of Summer and Washington Sts to the west, and a single flight up to a landing to the east. The landing also served an exit stair from Summer, a flight up to the surface, and a flight down to Filenes main basement. Down at platform level, an escalator leads directly from a high exit on the north platform to Hawley St.. Across the way further east, a similar exit leads to an escalator direct to Chauncy St. In the 1980s, the fare control was rearranged, and most of the concourse became an unpaid area, The Summer fare control now stretches across the concourse facing the Orange Line platform. Stairways and escalators connect the transfer passageways leading to Winter directly with Summer, and elevators link Summer with both sides of Washington for the disabled. Interestingly, disabled passengers at Winter cannot reach Washington, but can reach Park St. Under via the Winter Street Concourse. The westerly stairways from the Washington platforms now lead to high exits into the unpaid area. At the Chauncy St. end of the concourse the fare control also spans the concourse, allowing passengers to cross over within the paid area. There are no escalators or elevators at this fare control. Two other changes were made in the 1980s renovations. The platforms were extended about 120 feet to the east, with the extensions being somewhat narrower then the original portions. Finally the escalators at Chauncy and Hawley Sts., the last of the ancient, sharply inclined "cleat" type, were replaced with more modern "step" types. Leaving Washington the tunnel follows Summer St. along a gentle reverse curve to South Station Under, curving first to the east and then to the southeast. There is no center wall between the stations. The concourse continues above, ending at Purchase St. where a highway tunnel built in the 1960s interrupts it. East of the highway the concourse has recently been replaced by a new bus tunnel and station serving the Silver Line and scheduled to open at the end of 2004. An abandoned electrical substation occupies the final segment of the concourse, which was by now over 25 feet high. 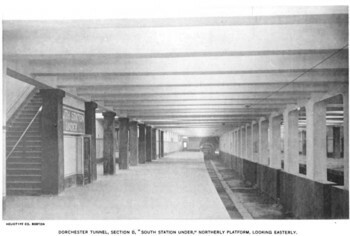 Dorchester Tunnel, Section D, "South Station Under", Northerly Platform, Looking Easterly. Boston Transit Commission report, 1916. South Station (Under) (Opened December 3, 1916.) South Station Under consists of two tracks with outside platforms. The name tablets and trim used dark blue tile. The original South Station (hence the "Under") was not the railroad station at street level, but a stop on the Atlantic Av. Elevated over 75 feet above and some distance south of the Dorchester Tunnel station. With no physical connection, passengers changing lines were forced to use paper transfers and venture outdoors to change trains. The original part of the station has a center wall which changes in character depending on what is above. It varies from a low wall with columns under the original fare lobby to a solid wall under the substation. A hatch in the ceiling was used to bring materials to and from the substation, which had no other access. Stairs and later escalators connected the platforms and fare lobby just above. From here, a long stairway rose to a landing overlooking the lobby from which perpendicular stairs rose to connect with passageways under the sidewalks of Summer St. From here, open stairways rose to the surface with one reaching west across Atlantic Av. to a covered shelter. A "cleat" type escalator connected a high exit on the south (outbound) platform directly to the same shelter. Service was discontinued on the Atlantic Av. el on September 30, 1938 and it was torn down between March 16 and June 11, 1942, No alterations took place at South Station Under as a result. There were several series of renovations made at South Station in the latter third of the 20th century. The first was the opening of a passageway into the basement of the railroad terminal where stairs and escalators lead up to the main concourse around 1980. This provided direct, all weather access to the subway for the first time, although a up and down detour in the existing passageway made for a six stairway trip to your train. Later a direct entrance into the new Federal Reserve Building was added, along with a passageway under Summer St. connecting the entrances on both sides. This provided customers with a level route around the "detour". The next change occurred at platform level where the platforms were extended 60 feet at each end. The eastern extension included a short piece of center wall from the original tunnel, while the western extension has no center wall. Due to clearance problems a trailing crossover was moved from the east side of the station to the west side. The "cleat type" escalator to Dewey Sq. was replaced with one of the "step type". The final renovation is still in progress in August 2004 and was triggered by the massive highway project known as the "Big Dig" In order to build new northbound lanes for I-93 underground, it was necessary to tunnel under the Red Line at a depth of about 100 feet. This was done as a cut & cover operation beneath a decked over Atlantic Av, After the highway tunnel was complete, a second tunnel and station was constructed above it for the Silver Line including a loop under Dewey Sq. This construction was at the level of the fare lobby, so a new fare lobby was constructed above the Silver Line for combined access. The new lobby is west of the original and at the same level as the passage from the railroad terminal, From there, a labyrinth of corridors, stairways, escalators and elevators connect the various platforms. The original lobby was closed and demolished, becoming part of the stairwells to the new facility. Leaving South Station, the grade continues downward and a pair of circular bored tubes bring the tracks under the Fort Point Channel. Immediately the tunnels turn to the southwest and level out running about 3000 feet on tangent. About halfway down the tangent, the grade becomes about 3% upward. At the end of the tangent, the grade levels out, the twin tubes end and short cut & cover tunnels curve south under Dorchester Av. into Broadway Station. An interesting note here is that the tunnels do not cross the Fort Point Channel, they run along its length. Broadway (Opened December 15, 1917; middle level closed October 14, 1919.) Broadway was built on three levels, with two tracks and an island platform on each level. Tile on trim and name tablets was Kelly Green. The lowest level served the subway trains, and was long enough for five cars. A half dozen straight stairways connected directly to the middle level where streetcars serving Dorchester terminated. An underground loop north of the platform allowed the cars to efficiently reverse direction. The cars entered through a portal in the middle of Dorchester Av. south of West Fourth St. One more flight of stairs connected up to the third platform, on the surface in a wood sheathed shed in the middle of the approach to the Broadway Bridge. Cars connecting South Boston to the Tremont St. Subway stopped at this shelter. Broadway was unique in that with so many provisions for paid passengers, no consideration was given to pedestrian entry. Those wishing to enter on foot had to brave the streetcars and other traffic in the busy intersection, and enter through a small door between the tracks leading into the shed, where a limited fare control greeted them. The first changes took place in 1919, less than two years after the station opened. The middle level was abandoned outright! The reason for this change was that the subway had been extended south about a mile to Andrew Sq., and that all of the streetcars now terminated there with the exception of a single route from Bay View. The section of Dorchester Av. in between was mostly industrial and generated no ridership. The portal south of West Fourth St. remained in place until 1940, when it was filled in. Most of the connecting stairs were boarded up at this time though one remained useable for the huge crowds which descended on the station after the annual St. Patrick's Day Parade. The Bay View streetcar line was bustituted in 1929, at which time the shelter was paved, and another Boston specialty, buses with left hand doors, shared the platform with the Broadway cars. The Broadway cars lasted another 24 years, but upon their demise in 1953, traffic through the shelter was reversed so ordinary buses could be used here. The next change to take place was the relocation of the fare control to the lower platform when subway and local fares were altered in the 1950s, the change which inspired "Charlie on the MTA". Paper transfers were now used to separate locals from through passengers and make sure the infamous "extra nickle" was collected. Transfers of all kinds were abolished in the 1960s and separate fares collected for every ride. The biggest change at Broadway took place in the 1980s when the old shelter was replaced with a one-way (outbound) version and a pedestrian entrance was opened at the southeast corner of Broadway and Dorchester Av. Fare control was moved up one level and now occupies part of the old platform and tunnel. Four of the stairways linking the middle and lower platforms were demolished at this time, opening up the platform for better passenger safety. The subway platform was extended south to accommodate six car trains in the 1980s, the work requiring no structural changes to the tunnel. Leaving Broadway, there is an opening in the center wall for a trailing crossover. The wall then resumes for about 1000 feet, to support the upper level and a railroad right of way which crosses below Dorchester Av. south of the former portal. After the end of the center wall the tracks rise up to just below the surface and continue at that level for about 2000 feet before ramping down again, curving slightly to the southwest and entering Andrew. The center wall resumes just before the station. Andrew (Opened June 29, 1918.) Andrew is a side platform station constructed with a large trolley station on the surface. Trim and name tablet tile were yellow. Within the original station, the center wall is low, with periodic support columns/ A "cleat" escalator led from the outbound platform to the middle platform of the trolley station. Stairs facing south at track level led to a passageway above the subway station, which in turn led to stairs up to the southerly streetcar platform. A similar connection, with the lower flights facing north, served the northerly platform. A passageway over the escalator connected the two "mezzanines". As at Broadway, a small fare control served walk-in passengers, but the entrance here opened onto the sidewalk of Dorchester Av., a much friendlier configuration. Streetcars entered the station from Dorchester Av. and exited via Ellery St. to Southampton St.
After the construction of the extension to Ashmont, the Dorchester Av. streetcar line was bustituted in 1930, at which time the surface station was paved. Trackless trolleys took over the Meeting House Hill and Franklin Park lines in 1949 The City Point to Dudley cars lasted another 4 years, and were the last streetcars to use the surface shelter. The next change to take place was the relocation of the fare control to the south half of the middle level when subway and local fares were altered in the 1950s. The escalator and the stairs to the north surface platform became high exits. After the trackless lines were converted to bus in 1962, traffic flow through the surface shelter was reversed to reduce tie-ups on Dorchester Av. In the 1970s the original escalator was replaced with two of the "step" type. Later, in the 1980s, the usual narrow platform extensions were added, about 60 feet at either end of the original station. In the early 1990s a total replacement of the shelter was undertaken, with the original concrete structure with arched openings, giving way to a galvanized steel structure with a gabled roof and full length openings to Dorchester Av. and Ellery St.
Leaving Andrew, the tunnel curves a little more to the southwest under Boston St., and the center wall gives way to an opening for a trailing crossover. The subway continues on tangent, with a series of columns separating the tracks. The end of the tangent marks the transition from the Dorchester Tunnel of the 1910s to the Dorchester Extension built by the Boston Transit Department (Successor to the Boston Transit Commission) beginning December 3, 1924. The solid center wall resumes, the grade turns upward, and a sharp curve to the southeast aligns us with the Old Colony RR's main line. Just short of Dorchester Av. the tracks straighten out and the center wall ends. The roof of the subway rises above the surface, but the tracks remain enclosed until a short distance east of Dorchester Av. where the portal is located. The ramp was originally flanked by two low retaining walls, of which only the westerly example remains today. We enter what is officially known as 12 Interlocking or Columbia Jct. but was dubbed Malfunction Jct. by the MBTA workers in the 1970s as it was a source of frequent delays. The southbound track here is on its original alignment, but the northbound track ventures east and rises to allow the outbound track to Braintree to pass underneath. The switches connecting the Braintree line are located at the top of the ramp from the tunnel, and are followed immediately by a scissors crossover to the westernmost lead from the Cabot Yard. This yard lead was originally a freight siding which dodged around the subway portal so serve some customers near Columbia Rd. From here the tracks curve to the south, and after a facing crossover, we pass under Columbia Rd. and enter JFK-UMass Station. JFK-UMass (Formerly Columbia, opened November 5, 1927; Braintree platform opened June 23, 1988.) At this point it's appropriate to discuss the common architectural threads in the Dorchester Extension stations. many of which have succumbed to modernization. The primary pedestrian entrance to each station was through a brick headhouse, with cast concrete ornamentation over a bank of entry and exit doors. An enamel sign with the station name was mounted above these doors. External stairwells were metal clad enclosures, with the upper part enclosed in wire glass. Auxiliary entrances and exits were similarly enclosed, along with a heated waiting room on outdoor platforms. There was no decorative tile or name tablets. Station signs were enameled panels with white lettering on a black background. The signs were either hung from the platform canopy or mounted in an iron pipe frame. Columbia (JFK-UMass) was built as an island platform running south from Columbia Rd. The headhouse opened onto the bridge carrying Columbia Rd. over the tracks. The waiting room was located near the bottom of the stairs. At the south end of the 5 car platform was a high entrance/exit leading to a walkway between the tracks. At this point an enclosed stairway led to a walkway over both the subway and Old Colony tracks to a parking area to the east and to Sydney St. on the west. A station modernization effort in the 1970s replaced the original headhouse with a plain concrete one and provided a similar one at the south end which replaced the original stairs. The platform was extended south to the stairs making the station the second older one long enough for six cars. The waiting room was removed at this time. The South Shore Extension was now running through here non-stop on two tracks to the east while further east the Old Colony main line, once four tracks wide, was down to single iron as the Milton Secondary. Once UMass Boston opened near the station in the early 1980s, public demand for a stop here on the Braintree Line increased, and the MBTA, which had opposed such a stop because it would lengthen the trip for riders from Quincy and beyond, finally acquiesced. Not willing to simply build a platform with a crossover passage, the MBTA built a huge new enclosed fare lobby over the middle of the station, and closed both existing entrances. The new platform was matched fairly to the original but is offset a few feet to the south. Both are connected to the fare lobby by stairs and an elevator. From the lobby, passageways open to the weather lead to the original entrance on Columbia Rd., a new entrance on Sydney St., to the north of the original, and a new entrance on Mount Vernon St., complete with a busway and a kiss 'n ride platform. The south headhouse was retained and a new concrete passageway was constructed along with a stairway to the second platform. The exit stairs here were removed, and the passageway is used for employees only. At the north end of the new platform a high exit leads to a stairway connecting to the Columbia Rd. entrance. The 1970s era stairway bere was also converted to a high exit. The final change at this station came in the 1990s, when again, public demand persuaded the MBTA to add a stop here on the revived Old Colony Commuter Rail line, The platform lies east of the Old Colony track and is long enough for 5 85 foot cars. Despite all of this reconstruction, portions of the original platform and canopy at Columbia still stand, to the north and south of the stairs leading to the fare lobby. Leaving JFK-UMass, the tracks of the Dorchester Extension occupy the west edge of the five track right of way. A trailing crossover connects the inbound track to the outbound South Shore track at Interlocking 21. A second crossover, also trailing, connects the two Dorchester Extension tracks. just to the south. A viaduct carrying I-93 angles overhead from west to east. From here, the tracks continue on a tangent for about 1500 feet, and then enter a long curve toward the south by southwest. A retaining wall slowly rises to the west, we pass under Savin Hill Av. and enter Savin Hill Station. Until the 1960s, four bus routes visited here, with three of them terminating. Route 12 was a remnant of the old Dorchester Av. car line, running to Andrew. Route 13 served an area between Uphams Corner and Savin Hill by way of Pleasant St. before running to Northampton on the Main Line Elevated via Massachusetts Av. Route 14 was a feeder from the south, serving an area east of Dorchester Av. known as Clam Point. Finally there was Route 18, which connected Fields Corner, Savin Hill and Uphams Corner via Dorchester Av. and Stoughton St., which was also a successor to the original Dorchester Av. trunk. In the early 1960s, the bus routes serving here were altered, with Routes 12 and 18 being combined into the present Route 18 from Andrew to Ashmont. Route 13 was altered to serve Stoughton St. on every other trip and Route 14 was rerouted to Fields Corner, all in response to a request from the neighbors for fewer noisy buses on the local streets. The neighbors got what they wanted, as the changes sent ridership in the area into a downward spiral. Route 13 was abandoned in 1980, and Route 18 now runs base service on an hourly headway. Little changed at Savin Hill Station, with a "modernization" in the 1970s eliminating the waiting room, and about 100 feet added at the south end of the platform to allow six car trains to stop here. On May 28, 2004, Savin Hill stood as the most original of all the pre-war Red Line stations. By May 31, it was gone! The replacement station has since been finished and opened. Leaving Savin Hill the Dorchester Extension tracks climb a flyover clearing a freight siding, and descend onto an embankment shared with the Old Colony main and the South Shore Line, A gentle easterly curve starts at a bridge over Freeport St, followed by a much sharper curve to the west at the Old Colony's former Harrison Sq. stop. The right of way is now the Old Colony's Shawmut Branch, on which passenger service operated until September 4, 1926. The line quickly bridges Clayton St. By the time the curve ends the tracks are pointing almost due west and cross above Adams St. and Dorchester Av, in quick succession. The grade descends and we curve slightly to the southwest into Fields Corner. Fields Corner (Opened November 5, 1927.) Fields Corner was constructed as a five track affair, with three island platforms, each about 280 feet long. The southernmost platform served arriving streetcars, and inbound subway trains. The next platform served outbound subway trains and cars for Neponset (20), Quincy Center and the Fore River Shipyard (both Eastern Mass. extensions of the 20). The third platform served cars departing for Andrew via Meeting House Hill (17) and Dudley via Geneva Av. (19). Buses for Uphams Corner (18) and Adams St. (21) unloaded and loaded at street level below the southerly platform. Ramps carried the car tracks down to the surface at Dorchester and Geneva Avs. where both bridges were extra long and provided space for off street loops. In practice all cars entered and exited at Geneva Av. and looped at Dorchester Av. with the remaining switches and loop used for emergencies only. Fare control was at the bus stop on the lower level, and there were two crossunders here, one unpaid with a high exit down from each platform, while the second served as the paid entrance to the upper platforms. The unpaid crossunder continued to the headhouse which was only a facade extending from the north wall facing Charles St. Bus passengers were required to use a paper transfer here, while car riders walked across the platform, unencumbered by obstructions. A third crossunder at the west end of the platforms served a high exit to Freeman St.
Eastern Mass. car service ended in May of 1948, and the replacement buses were relocated to the lower level. Car service on Route 20 was converted to bus a month later, and likewise relocated. The ramps were paved, and other modifications completed, and in 1949 Route 19 followed by route 17 were converted to trackless trolleys. Later in the year, Route 20 was converted from bus to trackless, and restored to the upper level. Trackless wire was strung on the lower level, but was used for emergencies only. In the 1950s, the fare changes required relocation of the fare control to the inbound upper level, and the trackless platforms were fenced off from the subway. The easternmost stairs to the platform were located outside the fence and the high exits were removed, making these the main pedestrian entry. The adjacent crossunder remained in the paid area, and was fenced off from the bus platform at the old fare control. About this time, the 18 and 21 buses were moved to the upper level, leaving the lower level for the exclusive use of the Eastern Mass. Finally, pedestrian ramps were opened between Dorchester Av. and the unpaid areas on each side of the station. The early 1960s saw the replacement of the trackless trolleys on routes 17, 19 and 20 with diesel buses. As a result, the adjacent Park St. Carhouse and Dorchester Bus Garage were closed and the property redeveloped into a shopping mall. This, in turn, cut off access to the lower level busway, forcing the Eastern Mass buses to use the upper level. Up to this point, buses unloaded facing the wall on the upper level, so the MTA tried reversing the traffic flow through the station. This indeed sped up the trip through the station, but the effect on Dorchester Av. traffic was nothing short of gridlock, so the old pattern was reinstated. The 1970s saw the typical "modernization". The heated waiting room on the inbound platform was demolished, and the crossunder and exit at Freeman St. was bricked up. These were replaced with direct entry and exit ramps to Geneva Av. High glazed block walls were built around the remaining stairwells, the fencing was upgraded, new lighting was installed, and the headhouse was removed, replaced with a direct entry stair to the bus loading platforms. To accommodate six car trains, each platform was extended about 70 feet on either end in the 1980s, the west extension bridging Freeman St.
A plan for a massive renewal of the stations of the Dorchester Extension was developed in the first years of the 21st century, and construction started in the spring of 2004. The plans have evolved greatly, but, without the option of closing the station entirely as was done at Savin Hill, the customers are being greatly inconvenienced. On the first day of the spring schedule, the busways were closed and all buses loaded and unloaded under the Geneva Av. bridge and on adjacent MBTA owned land. The busway from Geneva Av. was torn down, along with the pedestrian ramp, forcing arriving passengers to walk up to the outbound side and then cross under the tracks to reach the fare control. Next, new fare controls were constructed at the bottom of the ramps at either end of the station, and the platform level fare control was closed. Next, on Memorial Day Weekend, the roof and upper sidewalls of the building were demolished, leaving the platforms (with the exception of the extensions, completely exposed to the elements. A new ramp from Geneva Av. to the inbound platform extension, using that structure to replace the previous bridge over Freeman St., was opened shortly thereafter. At present, demolition of the bus loading platforms is in progress. When the work is complete, buses will unload on the site of the original bus platform, and the fare control will be in about the same location as the original fare control. Artists conceptual plans show a bus loading platforms at track level, and stainless steel canopies over the platforms, but much is left to the imagination. Leaving Fields Corner the tracks bridge Freeman St. and Geneva Av., and begin a long sweeping curve to the southeast on a descending grade as the local street level rises. Just north of Park St., the tracks enter a shallow subway which crosses under Park St., Melville Av. and Mather St. From Melville Av. south the tracks are one a tangent, and at Mather St. we enter Shawmut Station The tunnel roof from here to Ashmont lies at or slightly above the surface, and is easily observed from the side streets. Shawmut (Opened September 1, 1928.) Shawmut Station lies between Mather and Centre Sts. and was, at 420 feet, the only pre-war station designed to accommodate six car trains. Since for over 50 years, only four car trains stopped here, large iron gates blocked access to the southerly 120 feet of the platforms, which were dimly lit and dirty. The project to rehabilitate the platforms in the 1980s, saw the platform walls finished in tan glazed block, and a false metal ceiling installed with continuous fluorescent lighting. This gives the station an appearance similar to some latter day New York stations. Two stairways, meeting at a common landing rise from each platform. From the landings, a pair of stairways rise into the headhouse, where the fare control lies just inside the east facing entrance. The stairwells offer a glimpse of the original platform walls, plastered concrete walls with cutouts for advertising placards. Two secondary streets, Dayton St. and Clementine Park, meet at the entrance with the latter paralleling the subway to Centre St. The rather spacious headhouse is now the only survivor of those built with the line in 1927 and 1928. Internal changes are now in progress to provide elevators for the disabled, and spruce up the deteriorating platform area. The southerly two stairways up from the platforms are closed as part of that process, but the outright destruction seen at Savin Hill and Fields Corner does not seem likely. Leaving Shawmut, there is a slight curve toward the south, followed by a long tangent. Centre St. is crossed immediately leaving the station, followed by Welles Av. a long block away. From that point the line bisects the angle of Talbot Av and Dorchester Av. and continues on that heading until the two meet, at which point Ashmont St. also intersects, the junction of the three is known as Peabody Sq. Other than the Shawmut and Ashmont headhouses, the only building above the subway is an elderly apartment building occupying the spot where the two avenues divide. South of Ashmont St. the tunnel lies east of Dorchester Av. and curves briefly toward the southeast before entering Ashmont Station. Ashmont (Opened September 1, 1928.) Ashmont Station was constructed as a six track affair, with four island platforms. The rapid transit platform faces were about 350 feet long, while those serving streetcars were roughly 220 feet. The easternmost platform served arriving streetcars, and inbound subway trains. The next platform served outbound subway trains and cars for Mattapan (28). The other platforms served cars for Dudley via Washington St. (23), Dudley via Talbot and Blue Hill Avs. (22), Milton (27) and Brockton (Eastern Mass.). Ramps carried the car tracks up and over the subway in a loop at the north end of the station. At the south end an elevated junction sorted out arriving cars from the surface from those arriving and departing from Mattapan. Fare control was in the headhouse, which stood atop the tunnel facing Peabody Sq. Inside the turnstyles, separate stairways led down to passageways which flanked the tunnel. After passing under the streetcar loop the tunnel and passageways emerged above local ground level, and the dividing walls ended, forming the north end of the platforms. About 75 feet later the streetcar ramps reached the grade of the platforms and the main shelter began. The shelter over the three streetcar loading platforms was somewhat shorter than that over the rapid transit platforms, allowing for the curves which took the cars out to Dorchester Av. At the south end of the platforms, high exits opened into walkways which led to Radford Lane and Beale St. A crossunder connected the two dead-end streets. It is unclear whether any provision for entry was made here. No accommodation was made for bus passengers, as there were no bus lines serving Ashmont at the time. The first two bus lines to serve Ashmont were reroutes of car lines which were holdovers from the days before the Dorchester Extension. The Washington Street line originated at Andrew Station and followed the route of the Meeting House Hill line (17) to Geneva Av. and Bowdoin St, continuing west on Bowdoin to Washington where it turned left and followed that street to Fairmount St. where it terminated. This route was converted to buses shortly after Ashmont opened, and operated from Gallivan Blvd. to Ashmont via Washington St. and Talbot Av. Several months later, the Norfolk St. line was converted. This line ran from Nelson & Norfolk to Dudley Station via Norfolk, Washington and Warren Sts. As converted, the line was extended to Morton St. via Corbett St. and ran west on Morton to Norfolk. From there it followed Norfolk St. and Talbot Av. to Ashmont. The conversion of these two lines benefited both the Elevated and the riding public. The El. got rid of several miles of unneeded duplicate services. The public got route extensions and a quicker trip downtown. The one drawback in these changes was the lack of a facility for buses to load and unload but this was quickly rectified. Late in 1929, an addition to the west side of Ashmont provided a home for the buses. The busway was at the same level as the roof of the original station, and included a passageway atop the shelter leading to stairs down to the subway and streetcar platforms. The bus platform was the same length as the streetcar platforms, and included its own fare control at the end of the passageway. Buses entered from the south end on an elevated ramp and departed from the north end at street level. The platform area was wide enough for buses to pass each other, and the west side was enclosed by a wall of glass. Eastern Mass car service to Brockton ended in 1932, and was replaced by buses terminating on the busway, The el's car service to Milton ended in 1933 and was replaced with bus service to Mattapan (27), Joining these on the busway was a new route to Gallivan and Marsh (24 later 12), and new Eastern Mass services to Quincy via West Quincy (215), and Wollaston Beach (217). These changes left the main level with one car line for each departing track (22, 23 & 28) and seven bus routes on the upper level. Starting in 1948 the streetcar ramps and loop were widened and paved, and other modifications completed, and in 1949 Routes 22 and 23 were converted to trackless trolleys. In the 1950s, the fare changes required relocation of the fare control to the inbound subway platform, and surface lines were fenced off from the subway. The Mattapan cars became pay as you exit inbound, with the fare being collected at the subway platform for transfering passengers. Because of this high entry turnstyles were installed in the passageways from the headhouse and busway and on the entry (no exit) at Radford Lane. Likewise, passengers exiting to the headhouse, busway and Beale St. made their way through high exit turnstyles. Local passengers to and from Mattapan and the Dudley routes had to board or exit at the loop behind the headhouse. The early 1960s saw the replacement of the trackless trolleys on routes 22 and 23 with diesel buses. All of the MTA's buses now loaded and unloaded on the main level leaving the busway to the exclusive use of the Eastern Mass. The late 1970s saw the first "modernization". The heated waiting room on the inbound platform was demolished, and a new truss bridge was constructed over the north end of the platforms with stairs leading down to the platforms which were all now unpaid areas with the exception of the inbound subway platform. When this opened, the headhouse and busway were closed and demolished. The west wall of the shelter was removed and a fourth bus lane added, opening the entire station to the weather. Later, a second bridge was constructed at the south end and the underpass between Radford Lane and Beale St. was closed. 80 foot platform extensions were constructed at the south end of the station in the 1980s to accommodate 6 car trains. Late in 2003, the bus routings through the station were altered, to allow for the operation of Compressed Natural Gas (CNG) buses. Arborway based bus routes were converted first with the combined Washington - Norfolk line entering at the loop and unloading/loading on the outdoor platform, All other routes on this division loaded and unloaded at a new platform located in a former employee parking area even further west. Cabot based routes 18, 22 and 23 were converted in early summer 2004 and follow the same routing as Route 26. Only the Mattapan cars and the former Eastern Mass. routes based at the Quincy Garage which still uses diesels are allowed to use the inbound platform from which the latter were once banished. More changes are in the offing as a major rebuild of the station is planned for 2005. If the activities at Savin and Fields Corner are any indication, the effect will be drastic. South of the station, the tracks rise onto an embankment shared with the Mattapan trolley. A scissors crossover and a facing switch allow trains to enter any of three layover tracks, where ends are swapped and the trains wait their turn to proceed northbound. Originally the territory of Tower Q, this area is now Interlocking 14. The layover area and trolley line cuts Van Winkle St. in half, with no convenient connection between the sections for either pedestrians or autos. The three tracks merge back to two, and they cross a bridge over Gallivan Blvd, curve sharply to the right and enter Codman Yard, the primary storage area for trains operating on the Dorchester Extension. All tracks in the yard end at bumping posts, except the northernmost which loops around the yard and rejoins the main ladder track. Continue reading about the MBTA Mattapan-Ashmont Line, a short line operated with PCC trolley cars. We return to the portal south of Andrew, where we now join the route to Braintree. Like the Ashmont route, the inbound track is on the upper level here passing over the connector from Cabot Yard before joining the main route to Andrew. The outbound track passes under the inbound Dorchester track and both merge with their respective leads to Cabot just north of Columbia Rd. After passing under Columbia Rd. we enter JFK-UMass Station, which is described in connection with the Dorchester Extension, South of the station we begin the longest run between stations on the Boston system. Immediately, the tracks pass beneath the I-93 viaduct, beneath which are trailing and facing crossovers along with the final connecting switch to the Dorchester Extension, which make up Interlocking 21. The tracks now rise onto a steel and concrete bridge which carries us over the Old Colony's single track main, and we return to grade and pass beneath Savin Hill Av. A gentle easterly curve starts at a bridge over Freeport St, and at the site of the Old Colony's former Harrison Sq. Station, the Dorchester Extension swings off to the right. We are now on a very long tangent, and the Old Colony widens to two tracks. The next bridge spans Victory Road, soon followed by a pair of bridges over Morrissey Blvd. Between the bridges, one can see the remains of Popes Hill Station, another abandoned Old Colony stop. Conley street is quickly bridged after which we pass under I-93 again and come alongside Tenean Beach. Redfield St. crosses overhead and we enter the ramp leading to the Anderson Bridge which carries us over the Neponset River. Back in 1960, a fire under the south approach to the drawbridge located here, insured that the New Haven, owner of the Old Colony, would never resume commuter rail service, setting in motion the chain of events leading to the construction of the South Shore Extension. The new Old Colony main now crosses beside us on a bridge built in the 1990s. Beneath the northerly bridge approaches lies the site of the Old Colony's former Neponset Station. The view from this bridge is second only to that from the Longfellow, and includes many pleasure craft, a salt marsh, and the Boston Skyline in the background. We descend to a brief cut, passing under Quincy Shore Drive, and through the site of Atlantic Station on a southerly curve. Hancock St. passes overhead, and the route curves to the southeast again, passes through the scissors crossover at Interlocking 22, and enters North Quincy Station. North Quincy (Opened September 1, 1971.) North Quincy Station, which is not on the site of a former Old Colony station, is located at the corner of Newport Av. and West Squantum St. and features two tracks with an island platform, plus the two Old Colony tracks which pass through to the west of the rapid transit. Concrete and glass are the primary architectural elements of this station, which is extremely functional in design. There are two headhouses at the north and south ends of the six car platform, each located one flight up. The south headhouse is open full time, and includes an exit to the east via a ramp or a few steps to a platform where three bus routes stop. A few more steps take one down to a huge parking lot occupying most of the triangle formed by Hancock St., East Squantum St. and the tracks. A stairway to the west leads to a small parking lot along Newport Av. The north headhouse is open from the start of service to 7 PM, and features exits to the Hancock St. parking lot, and to an office complex along Newport Av. Extension. North Quincy has seen one major alteration since opening, a renovation of the headhouses which added a glassed in passageway atop the platform canopy at each end, leading to elevators connecting with the platform. Elevators were also added to the other stairways at the north headhouse and a ramp to West Squantum St. from the south headhouse completed the project which made the station ADA compliant. When it opened in 1971, North Quincy required a double fare to enter and an additional fare to exit. The extra fares were done away with in 1980. Leaving North Quincy, the tracks begin a long run which despite having no major curves involves numerous minor deviations and grade changes. The Red Line, Old Colony and Newport Av. immediately pass under West Squantum St. while ramps connect the latter to an elevated intersection. Just south of here the Old Colony resumes single track operation, which will continue until just north of Braintree. At Billings Road we pass under a pedestrian walkway which marks the site of Norfolk Downs, yet another former Old Colony stop. We continue southeastward slowly climbing onto an embankment while Newport Av. drops somewhat, and enter Wollaston. Wollaston (Opened September 1, 1971.) Wollaston, located just north of the site of the Old Colony's former Wollaston stop, has two tracks with an island platform long enough for six cars. A canopy covers about one half of the platform. A simple arrangement of stairs and an escalator lead down to a fare lobby below the tracks. From the unpaid side of the lobby exits open west onto Newport Av, at Granger Brook St. and east into the smallest of the South Shore Extension's parking facilities. Wollaston is the only station on the branch to have no special facility for buses. Only the 217 from Ashmont officially calls here, stopping on Beale St., a block north of the station, Two other buses stop nearby, the 212 at Beale St. and Newport Av. and the 210 at Beale and Hancock, four blocks east. Like North Quincy, Wollaston required a double fare to enter and an additional fare to exit. The extra fares were also done away with in 1980. Leaving Wollaston we quickly pass under Beale St. while Newport Av. rises steeply within the space of one block to intersect Beale St. adjacent to the bridge. From here south to Furnace Brook Parkway the tracks continue at a consistent grade while the surrounding land slowly drops. Furnace Brook Parkway is crossed on a plate girder bridge while Furnace Brook itself occupies an adjacent culvert. The surrounding land now rises again with Adams St. crossing on a concrete overpass. The tracks enter a deep cut, and curve slightly to the south as we pass through Interlocking 23, which consists of facing and trailing crossovers. These were used to reverse trains when the line opened in 1971. After passing under Dimmock and Saville Sts. we enter Quincy Center. Quincy Center (Opened September 1, 1971.) Quincy Center has two rapid transit tracks with an island platform, and one commuter rail track with a side platform. Both platforms are situated beneath a large parking garage, with about half of the first floor occupied by stores and the Red Line fare lobby. A five bay bus platform adjoins the parking garage. The west side of the station abuts Burgin Parkway and a pair of short downward stairways provide the entry here, sheltered by a replica of the original Harvard kiosk. The entry from the bus platform involves about three steps up. To the east of the station, there is an exit lane for the buses, and a layover area with access back to the platform. Quincy Center is a terminal point for Routes 210, 211, 212, 214, 215, 216, 220, 221, 222, 225, 236, 238 and 245, all of which are former Eastern Mass services. Most of the buses pull into the loading area, discharge their passengers, pull into the layover area, and then return to their berth to load. Route 245 is an exception, it unloads at the Burgin Parkway entrance, and lays over there before pulling around to the loading platform. Quincy Center requires a double fare to enter, and originally required an exit fare. The exit fare was abolished with the changes of 1980. Leaving Quincy Center the tracks remain in the deep cut for about 1000 feet, passing under Granite St. Interlocking 24 is immediately south of the station and includes a siding between the two tracks capable of storing 8 cars. The main tracks at this point extended for 12 carlengths when the line opened in 1971, allowing the storage of 8 trains south of the station. The center track is accessible from the north only. Beyond this area we enter the second portion of the South Shore Extension opened in 1980. Burgin Pky and the tracks reach the same grade south of Granite St. and both, with the Old Colony commuter track in between, pass beneath School and Water Sts. Just south of Water St. we pass the site of the former Quincy Adams station of the Old Colony. Some distance further south we enter the current Quincy Adams station which stands at the point where Burgin Parkway diverges from the right of way opposite the intersection of Federal and Independence Avs. Quincy Adams (Opened September 4, 1983; trackage in use beginning March 22, 1980.) Quincy Adams like all the stops on the South Shore Extension consists of a single island platform serving the two rapid transit tracks. A wall separates these from the single Old Colony track. A fare lobby sits above the tracks part of the first floor of a multi level parking facility. Unlike the garage at Quincy, which sits above the tracks, the Quincy Adams Garage is perpendicular to the tracks and has ramps leading directly to I-93 or MA-3. The first floor is directly accessible from the local streets, and serves residents of West Quincy. A five bay bus platform adjoins the northwest side of the garage, and serves Route 238. A pedestrian entrance from Independence Av. on the northeast side of the tracks has never been opened due to local resident's fears that their streets would become free parking for out of towners. Part of the reason for the delay in extending the Red Line to Braintree was the siting of this station. In the beginning there were two stations planned, one in South Quincy and one in North Braintree. Local concerns mounted as the lots and garages at the line's original stations quickly began filling to capacity. The final compromise was to locate a single station at the present site, with direct ramps to the main highways. The state highway department took responsibility for building the ramps, and the station's opening was delayed until they were complete. Having been opened after the fare realignment of 1980, Quincy Adams collects a double fare inbound and an exit fare outbound. Leaving Quincy Adams the rapid transit tracks rise onto an embankment, while the Old Colony track descends. After its junction with the former Granite Branch, now merely a siding to a newspaper plant, the Old Colony burrows under the Red Line and turns eastward. The rapid transit tracks also turn eastward and descend to match the grade of the Old Colony and MA-3, the main highway from Boston to Cape Cod. The many grade changes in this area, combined with the desire to discourage motorists from using local streets to reach Quincy Adams resulted in Centre St. being cut off through this area, though a pedestrian tunnel was maintained through the embankment. The Old Colony, Red Line and highway pass under Washington and Elm Sts. East of the latter is the Braintree Wye, where the Old Colony Main connects to the Greenbush Branch and the Fore River RR. A short siding parallels the east leg of the wye. East of the wye, the tracks curve back to the southeast, passing under the highway and enter Braintree Yard an Old Colony facility used for marshalling local freight. Within the yard area there is a siding off the Red Line tracks extending far enough to store a six car train on either side of a single crossover from the northbound main. Exiting the yard, the Old Colony briefly becomes double tracked, and enters Braintree Station. The Red Line tracks encounter Interlocking 26, with facing and trailing crossovers, cross the bridge over Union St. and enter Braintree Station. Braintree (Opened March 22, 1980.) Braintree consists of two rapid transit tracks with an island platform located east of Union St. and two commuter tracks with an island platform located above and to the west of Union St. A fare lobby below the tracks serves the rapid transit platform only. There is a bus platform, served by Route 236, and an auto drop off outside the fare lobby, which occupy one half the lower level of a three level garage. Buses and traffic from MA-3 enters the station by way of a bridge over Union St. and exits onto parallel Ivory St. Pedestrians reach the commuter station by following a ramp leading to the Union St. bridge and crossing one track at grade. The crossing is signalled to prevent accidents. When Braintree opened, a triple fare was collected entering and a double fare was collected from those leaving. The fare realignment implemented later that year changed this to double fare entering and a single fare exiting, though with the doubling of the base fare at the time, this still resulted in an increase. The original cars purchased in 1911 and 1912 would be the longest in the world for well over 50 years and were constructed almost entirely of steel. The doors were spaced along the sides of the cars and were single panels sliding into pockets in the side of the car. Five side windows separated each pair of doors, with three more added at the ends. The windows at the door pockets could not be opened but all others could. Sash were of wood construction. Wooden seats all faced a wide center aisle, with sprung steel and porcelain handholds overhead. A bulkhead at one end of each car created a smoking compartment for those so inclined. All cars had a monitor-arch roof, with the carlines bent to form the shape of a raised monitor. The ends of the monitor were flat and included openings for marker lights. The cars were 69' 3" long and 9' 6" wide. In keeping with established practice the communicating doors between cars were not open for passengers use, but could be replaced with an open grate for summer ventilation. Guards would use these doors to reach their control station between the cars, where 6 push buttons on each car would activate the individual passenger doors. Two series of cars were available when the line opened in 1912, 40 No. 1 cars built by Standard Steel and numbered 0600 to 0639, and 20 No. 2 cars built by Laconia and numbered 0640 to 0659. The two groups differed in the construction of their underframes, with the No. 1s having the side panels extend down between the trucks to reinforce the door openings and hide underbody equipment from view. The No. 2 cars simply used a heavier side frame and the side panels ended just below the floor. These provided enough equipment to operate the line until 1918, when operation to Andrew began. Wartime priorities delayed delivery of the new cars then on order, and some elevated cars operated here for a short time. The No. 3 cars arrived in 1919, and were virtually identical to the No. 1 cars. The 35 cars were built by the Pressed Steel Car Co. and were numbered from 0660 to 0694. The next order of cars was delivered in 1927 for the Dorchester Extension and featured many changes while appearing identical to their predecessors. Most notable among these were changes in the doors and sash. The doors were hung outside the carbody, eliminating the pockets which tended to fill with debris and snow. They were operated with electric motors instead of air engines. The sash were now framed in brass, and were spaced more evenly. Inside, the smoking compartment was eliminated, opening up the interior. Outwardly from a distance, the cars still appeared to be twins of the No. 1 cars. The 60 No. 4 cars were built by Osgood Bradley, and were numbered from 0695 to 0754. The first major change made in the Cambridge-Dorchester fleet came around 1930, when Multiple Unit Door Control was applied to all cars. In theory this could allow a single guard to control all of the doors in a train from a single toggle switch. In practice, it meant that the single switch controlled all the doors on its car since a law was hastily passed requiring one guard for every two cars to protect the public safety (and the jobs of several hundred Elevated employees). The next change came in 1947 when four cars 0706, 0719, 0723 and 0724 were modernized to include features planned for inclusion in cars planned for operation on the Braintree extension, then on the drawing board. These included reversible upholstered transverse seating, forced air ventilation and fluorescent lighting. A new paint scheme, orange with a gray roof replaced the standard "Pullman Green" on the exterior. The extension would remain on the drawing boards for another 19 years, and the four cars would soon be lost among their 151 brethren. New lighting was installed in 150 cars in the early 1950s, this time PCC style bullseye incandescents. One car would retain its original fixtures to the end. The mid 1950s saw the scrapping of the 20 No. 1 cars in the poorest condition. Finally, in the late 1950s, several cars were repainted into the orange and gray scheme adopted for the Main Line Elevated. As time took its toll on the original Cambridge-Dorchester fleet, new equipment had appeared on all of the other lines. Finally, in the early 1960s, the MTA placed an order with Pullman-Standard for 92 cor-ten steel cars identical in dimensions at the floor with the previous cars, but wider above, a design pioneered on the Elevated cars of 1957. A monitor-arch roof was also used as in the earlier cars but louvers for air intakes filled the space between the monitor and the sides, resulting in a smooth roof line. There were four door openings per side, with those near the ends located adjacent to the full width cabs. An openable window behind the operator was designed to allow on-board fare collection, with an eye toward the coming South Shore extension, or a possible extension of the Dorchester line to Mattapan. Other features included 4 circuits of bullseye lighting, two panel outside hung sliding doors, two large picture windows between each pair of doors, six ventilating fans as on the Braintree 0700s and a new paint scheme using the colors of the state flag. The bodies were blue below the windows and on the roof, with white in between. A gold stripe circled the car separating the blue and white below the windows. At the operating ends, the stripe widened to fill the space from the floor to the roof line. Lighted destination route and number signs were located above the end doors and side windows. Mechanically and electrically the cars were far removed from their predecessors. The major difference was that the cars were single ended and coupled back to back in semi-permanently married pairs. Odd numbered cars carried the air compressor, while even numbered cars carried the motor-generator and batteries. 46 cars used GE's SCM control system (01400 to 01445) and 46 used a Westinghouse system of similar design (01446 to 01491). All cars had Cineston combined master and braking controllers, and SMEE braking. Performance was superior to the older cars, and signs with the letters P (power), C (coast) and B (brake) were posted along the line to quietly remind operators how to run them. The last two cars in the order (01490 and 01491) featured molded fiberglass ends, which were provided by Pullman to test the technology in advance of an order for the Chicago Transit Authority. As the 01400s arrived, the older cars were gradually scrapped. All of the No. 1 to 3 cars were junked, along with almost 2/3 of the No. 4 cars. Twenty one were retained including all four Braintree cars, but they saw very little use over the next 6 years. Four (0709, 0749, 0753 and 0754) were assigned to work service. Sixteen cars were retired in 1969, and were moved from Eliot Yard to Codman Yard for storage. Fifteen were later moved to the New Haven's Dover St. yard for scrapping, and Braintree car 0719 was moved to the Seashore Trolley Museum. Car 0747, which had been heavily stripped, and not considered safe to be towed through the subway, was left at Eliot, and would be scrapped along with the shop in the late 1970s. The work train would survive until the early 1980s, when it would be replaced by 01100 cars from the Orange Line. Car 0753, in the orange and gray scheme, was moved to Maine in 1983 to join 0719, and the other three would follow some years later to serve as mobile storage. The first major change in the Bluebirds was the installation radios in the late 1960s and of cab signal equipment in the mid 1970s. This effort was designed to allow the regular use of these cars on the South Shore Line to take advantage of their greater capacity. Unfortunately, the equipment was unreliable, and would be replaced when the cars were overhauled in the early 1980s. Other aspects of the overhaul included the installation of headlights and a public address system. The cars were painted in red, white and gray, and were rechristened Redbirds. From almost the beginning the Bluebirds would develop a reputation for being noisy and uncomfortable. Their demise in the early 1990s would not be mourned by many. Their interior had one saving grace, it was bright and cheerful, a trait not found on any of the present Red Line cars. The opening of the South Shore Extension in 1971 resulted in a new rapid transit car to service the route. From the beginning, the MBTA planned for lower ridership on this suburban operation than its urban partner. Therefore it was planned to have a car with more comfortable seating and less standing room as in the Braintree 0700s. Seventy six cars were ordered from Pullman-Standard in 1967, and delivered in 1969. There were two number series. Cars 01500 to 01523 were single unit, double ended cars, while 01600 to 01651 were married pairs, set up in the same manner as the Bluebirds. The basic body shape of the Bluebirds was retained with two exceptions, the ends were flat instead of tapered, and the door spacing of the original cars was returned. The exterior was unpainted brushed aluminum, with a narrow red stripe on the sides only, and a simple corrugated arch roof replaced the compound roof of the 01400s. Another external change was the use of headlights to improve night visibility. Inside, the ceiling was lower and flat, to accommodate air conditioning condensers, blowers and evaporators in the space above. The interior finish was light gray with black seats and stainless steel grab bars around the doors. The seats were thickly cushioned and most were fixed facing either forward or back. A single seat next to each door faced inward and concealed the door engine. Door pockets returned on these cars and were weatherstripped to keep debris out. Fluorescent lighting was used throughout. including the number boards, which were black on white, reversing the scheme used in the 01400s. From the very beginning, ridership on the South Shore Line exceeded expectations. Crush loads developed at rush hour and low reliability of the cab signal system resulted in a verbal train order system being used to back up the signals. The easiest solution was to run the cavernous Bluebirds on the line at rush hours, with an official in the cab to insure that the non cab signalled cars were being properly operated and not exceeding their clearances. Certification of the signal system around 1976 eliminated the verbal train orders, but also banished the Bluebirds, until their cab signal systems could be made functional. Many signal failures on the Silverbirds resulted in a retrofit in the late 1970s, moving the signal controls from under the floor to the cab, where they could be easily accessed. Later a change in the control and display interface would give us the system in use today. By 1980, the original seats were suffering from vandalism, and the crush loads were causing many delays. The cushioned seats were removed and replaced by thinly cushioned seats with stainless steel frames. Between the doors two pairs of transverse seats were mounted back to back, The remaining six faced inward. At the ends, transverse seats at the bulkheads faced away from the bulkhead, and all other seats were longitudinal. This greatly improved the standing capacity of the cars, and cut delays significantly. A mid-life rebuild was begun in 1985, and addressed worn and buckled floors among other issues. The cars returned to service with all longitudinal seating, and the "Redbird" paint scheme, the aluminum exterior having turned brown over the 14 years of service. The double ended cars were converted to single end at this time, but remained independent units. In 2004 at age 35, 74 of the original 76 cars remain in service, two having been wrecked in 1974. Concurrent with the overhaul of the 01500 and 01600 cars, the MBTA decided to purchase 58 visually and operationally compatible cars to enable the operation of six car trains. All of the features added in the overhaul of the older cars were included in the new cars, along with a few styling and safety changes. The corrugated roof of the older cars was replaced with smooth panels. The lighted number boards were eliminated, and replaced with decal numbers. The bodies were constructed of cor-ten steel instead of brushed aluminum and emergency outside releases were placed at each door engine. The cars were constructed as single end single units but are operated in back to back pairs in the same manner as the 01500s. It is not unusual to see one pair of each type in a six car train. Cars 01700 to 01757 were built by UTDC from 1987 to 1989. All remain in service in 2004. The 01400 class was approaching 30 years of age in the early 1990s, and doing little to assure management of their continued viability. Although the carbodies were structurally sound, the mechanical and electrical equipment was an issue, being split between two manufacturers, and earlier versions of equipment in use in other cars. Secondly, the 01400s were not being operated in six car trains, possibly due to either equipment limitations or the door configuration. In any event, the MBTA decided to retire the cars, and ordered 86 replacements from Bombardier. The new cars, delivered in the early 1990s and numbered from 01800 to 01885, are the first stainless steel subway cars in Boston, and the first to use AC propulsion. Other amenities included automated stop announcements, electronic destination and route signs, and an on-board diagnostic computer. Like the 01600s the cars are single ended and share equipment. They are coupled back to back in married pairs. Like the 01400s they replaced, the 01800s only run in trains with their own kind, due to the technical incompatibilities. The carbodies are unpainted with the exception of a 12 inch red band below the windows. Inside, the same gray scheme as on the older cars was specified, but the seats were made of thin, red fabric cushions set in a sheet metal frame. These were later replaced with red vinyl, and more recently with the same black vinyl used on the other cars. Like the 01400s they replaced, the 01800s have four doors per side, but the spacing is closer leaving some space between the cabs and the first set of doors, allowing some leeway on short platforms. Today, the Red Line is served by a fleet of 218 cars, including 24 01500s, 50 01600s, 58 01700s, and 86 01800s. The stripped bodies of 01604 and 01605 reside at Codman Yard as a parts source. Four 01400s remain as work cars, 01469-01470 and 01477-01480. Eliot. When the Cambridge Subway opened in 1912, the initial segment included a yard and shop facility adjacent to the existing Bennett St. carhouse, which served Division 7 of the surface lines. Bounded by Memorial Drive and Boylston St. on the south and east respectively, the facility included a three track shop and several stub end yard tracks. A loop track followed the outer edge of the yard and served as a ladder for the storage tracks. West of the shop a single track connection led from the loop to the Bennett St. surface trackage. The rapid transit facility was named Eliot Shops (for a nearby side street) and served the line as its primary maintenance facility until Cabot Shops opened in the early 1970s. Storage at the site continued until it was abandoned later in the decade. Codman. The second yard facility on the line was opened in 1928 concurrent with Ashmont Station. The facility consists of a three track reversing facility directly south of Ashmont Station, and a storage yard with about a dozen tracks facing east-west south of Gallivan Blvd. The section of Gallivan Blvd. adjacent to the yard was originally Codman St., and for this reason the yard became known as Codman Yard. As at Eliot, a loop track surrounds the storage yard, and a surface connection off of it once followed Codman St. to Dorchester Av. A wash rack, added to wash the 01400s in the 1960s spans the loop track adjacent to Gallivan Blvd. Codman Yard remains active in 2005 and supplies most of the trains for the Ashmont Branch. Quincy. Always intended as a temporary facility, Quincy Yard encompassed the two future main line tracks south of Quincy Yard encompassed the two future main line tracks south of Quincy Center along with a single, stub end track in the middle. Since the practice at the time was to run two car trains off peak, the outer tracks could hold ten cars each while the center track was good for eight. Since the car requirements for the Quincy service at the time were identical to those for Ashmont, this space, plus that at Eliot was sufficient to cover the service to Quincy, while only two two-car Ashmont trains entered service from Eliot. Quincy Yard lost its identity when the line was extended to Braintree in 1980. Today, the center track is used to reverse two trains which enter service from Cabot to Quincy in the AM rush and for service diversions as needed. Cabot. Like Eliot, which it replaced, Cabot consists of a rapid transit facility adjacent to a surface facility, in this case a bus garage which shares its name. Cabot is unique among the MBTA's yard facilities, in that it sits about 1.5 miles from the point where its leads become the South Shore Line's main tracks (flying crossovers carry the revenue service onto the Dorchester Extension's tracks at this point). The facility consists of a shop building with some adjacent storage tracks south of East Berkley St. and about an eight track storage yard north of that street which extends past Broadway. The main yards for Amtrak and the south-side commuter rail are west of the Red Line yards, and just south of the facility the branch to the South Boston waterfront passes below the leads, while a viaduct carries the Old Colony commuter tracks from the west side to the east. Cabot is now the only repair facility on the Red Line, and the yards are primarily used for cars awaiting inspection or repair. Two South Shore trains pull out from here on weekday mornings and pull back after the evening rush. The remaining moves to and from the yard include trains coming for and leaving after repair work, and the line's work equipment, which is based at Cabot. Incidentally, the name Cabot honors a past employee, not the famous Boston Brahmin family. Caddigan. The fifth yard to serve the Red Line is Caddigan Yard, a four track facility south of Braintree Station. Caddigan is a rather small facility, and is augmented by a siding off the main line north of the station and by overnight lay-ups in the station itself. Like Cabot, Caddigan honors a former employee. Alewife. Finally, six trains are stored overnight at Alewife, two in the station, and four on two underground dead end tracks extending to the west. This continues a longtime pattern of storing some trains overnight at both ends of the line. The number of trains stored at the north end increased from four to six after the line was extended beyond Harvard in 1983. These were stored in Eliot Yard until it closed, then three were stored in the turnback and one in Harvard Station until Harvard Brattle opened in 1978. From that time to 1983, three were stored in Harvard Brattle, and one in the former turnback area. From 1983 to 1985 the six trains were stored in the tunnel between Davis and Alewife. Dorchester Rapid Transit Extension News (1915-1931). 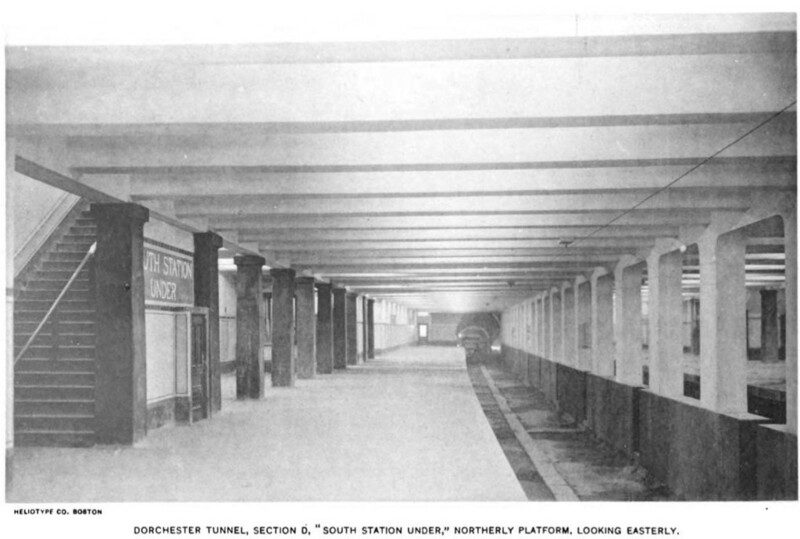 A collection of short news articles about Boston's Dorchester Tunnel subway. Electric Railway Journal, 1915-1931. Dorchester Rapid Transit Extension Completed. New Features Embodied in Cars for Dorchester Extension. Power for Dorchester Extension. Large Car Yard Designed for Dorchester Extension.